Moleculera Labs is working to uncover improved ways of identifying and diagnosing infection-triggered autoimmune neuropsychiatric conditions. As a leader in this field, news stories are frequently published about The Cunningham Panel, our events and ongoing research. A subset of children with autism spectrum disorder (ASD), who have an immune abnormality, may benefit from intravenous immunoglobulin (IVIg) treatment, according to new research from Richard E. Frye, MD, PhD, Chief of Neurodevelopmental Disorders at the Barrow Neurological Institute at Phoenix Children’s Hospital. According to Dr. Frye and colleagues, this is the largest case series examining children with ASD who have been treated with IVIg. The article “Intravenous immunoglobulin for the treatment of autoimmune encephalopathy in children with autism” is published in the August issue of Translational Psychiatry. Using the Cunningham Panel™, the authors identified, for the first time, immune biomarkers that can predict with over 80% accuracy which children with ASD will respond favorably to IVIg treatment. Recent studies have shown that some children with autism spectrum disorder have an immune system dysfunction. While the standard of care for ASD is behavioral therapy, individuals with a physiological abnormality, such as an immune dysregulation, may require more comprehensive medical treatment. The majority of ASD patients had elevated levels of these autoantibodies measured by the Cunningham Panel™ along with an elevation in the activation of calcium calmodulin dependent protein kinase II. However, very few patients had other brain targeted autoantibodies associated with autoimmune encephalopathy (AIE), such as voltage-gated calcium channels autoantibodies. Moleculera Labs, Inc., an autoimmune neurobiology company, today announced that a key patent has been issued covering the company’s Cunningham Panel™ and its use in helping physicians identify whether an individual’s neurologic and/or psychiatric symptoms could be caused by an autoimmune dysfunction. Specifically, the new patent, US 9,804, 171 B2, covers methods of diagnosing Pediatric Acute-Onset Neuropsychiatric Syndrome (PANS) and Pediatric Autoimmune Neuropsychiatric Disorder Associated with Streptococci infection (PANDAS). The Cunningham Panel™ can help identify the level of autoimmune antibodies associated with such neuropsychiatric disorders and the capability they have to stimulate and trigger neurologic behavior. Research has found that obsessive compulsive disorder (OCD), tics, anxiety, attention deficit hyperactivity disorder (ADHD), and sometimes behaviors associated with Autism Spectrum Disorders, may be caused by a treatable autoimmune condition, triggered by common infections. Results of the Cunningham Panel™ assists physicians in determining the likelihood that a patient’s neuropsychiatric symptoms are due to an infection-triggered autoimmune response, rather than a primary psychiatric disorder. 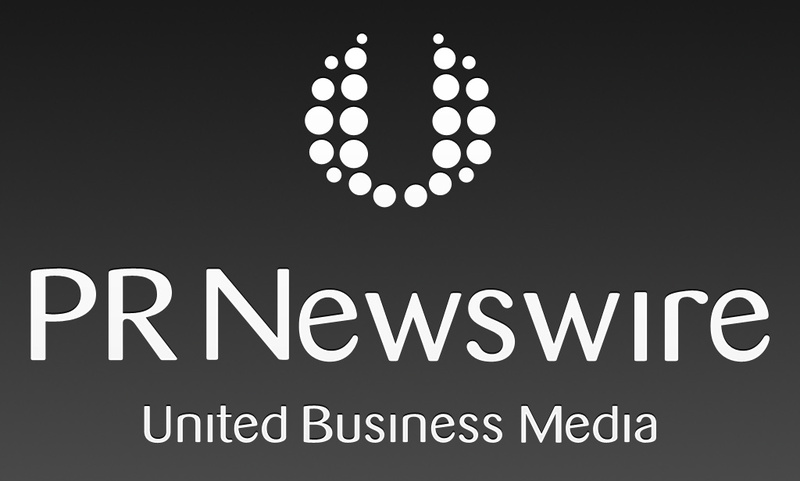 “This patent provides strong intellectual property coverage for our panel, which is an aid to physicians in diagnosing infection-triggered autoimmune neuropsychiatric disorders, and has steadily gained usage by a growing number of clinicians around the world,” said Craig Shimasaki, Ph.D., President and Chief Executive Officer of Moleculera Labs. Increasing evidence points to a relationship between certain bacterial infections and autoimmune attacks that can disrupt normal neurologic functioning according to researchers at Moleculera Labs. Using a panel of biomarker tests for autoantibodies against specific neuronal antigens and a key enzyme involved in the upregulation of many neurotransmitters can help physicians better diagnose and treat the underlying cause of such conditions, which are often misdiagnosed as psychiatric illnesses, motor tics or autism spectrum disorders and treated inappropriately with psychotropic drugs. 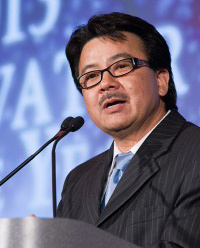 “Infections caused by bacteria such as Streptococci can trigger autoimmune attacks and brain inflammation that result in the sudden onset of severe behavioral disorders or other neuropsychiatric symptoms, especially in young children and adolescents,” said Craig Shimasaki, Ph.D., President and Chief Executive Officer of Moleculera Labs. “These conditions, referred to as Pediatric Autoimmune Neuropsychiatric Disorder Associated with Streptococci (PANDAS) or Pediatric Acute-Onset Neuropsychiatric Syndrome (PANS), are highly troubling to parents and exceedingly difficult for physicians to correctly diagnose and treat. The Cunningham Panel™ provides objective laboratory evidence of a patient’s autoimmune and anti-neuronal status that aids physicians in determining a proper diagnosis and therapy that often enables the child’s symptoms to be quickly reversed with appropriate anti-inflammatory and/or antibiotic treatments.” Launched in 2013, the Cunningham Panel™ has been ordered more than 3,000 times by over 400 physicians worldwide. Dr. Shimasaki will present additional details on the phenomenon of molecular mimicry and the use of the Moleculera Lab’s Cunningham Panel to help diagnose PANS and PANDAS at the 2016 Personalized Medicine World Congress, taking place from January 24-27 in Mountain View, California. He will also discuss emerging research that suggests a similar relationship between infection and molecular mimicry triggered autoimmune attacks in other neurologic conditions including Lyme disease, Alzheimer’s Disease and Parkinson’s Disease. Moleculera Labs, Inc., a CLIA (Clinical Laboratory Improvement Amendments) certified clinical laboratory offering testing services to aid physicians in their diagnosis of sudden onset neuropsychiatric disorders, today announced they have received renewal of their COLA (Commission on Office Laboratories Accreditation) certification. The company’s testing services are licensed in 49 states, with licensure in New York State pending. The Moleculera tests, known collectively as the Cunningham Panel™, help physicians determine whether the sudden onset of certain behavioral and movement disorders in children and adolescents, including obsessive‐compulsive behaviors, tics, anorexia and other psychiatric symptoms, may be due to an infection‐induced autoimmune attack on the brain. PANS (pediatric autoimmune neuropsychiatric syndrome) and PANDAS (Pediatric Autoimmune Neuropsychiatric Disorder Associated with Streptococcal Infection) are defined as clinical diagnoses. However, making the correct diagnosis can be challenging, as symptoms overlap with other neuropsychiatric symptoms and can be co‐morbid with other neurological disorders. The sudden onset of certain neuropsychiatric disorders in children, including obsessive-compulsive behaviors and tics, may be caused by infection-triggered autoimmune responses that attack the brain, according to key experts at the International Obsessive Compulsive Disorders Foundation Conference. Madeleine Cunningham, Ph.D., Chief Scientific Officer of Moleculera Labs and professor in the department of Microbiology and Immunology at the University of Oklahoma Health Sciences Center, and other notable researchers and clinicians will discuss the causes, diagnosis and treatment of PANS (pediatric acute-onset neuropsychiatric syndrome) and PANDAS, a subset of PANS associated with streptococcal infections, as a part of a special PANS/PANDAS program for researchers, clinicians and caregivers. The International OCD Foundation Conference is being held in Boston, MA from July 31 to August 2. Moleculera Labs today announced the receipt of a two-year, $300,000 matching grant from the Oklahoma Center for the Advancement of Science and Technology (OCAST). This grant supports the development and clinical validation of new diagnostic testing panels to identify autoantibodies directed against neuronal antigens in patients experiencing neuropsychiatric disorders such as depression, bipolar disorder and schizophrenia. Such panels are intended to assist physicians in identifying the subset of patients whose symptoms may actually be caused by underlying treatable infection-triggered autoimmune and inflammatory responses. 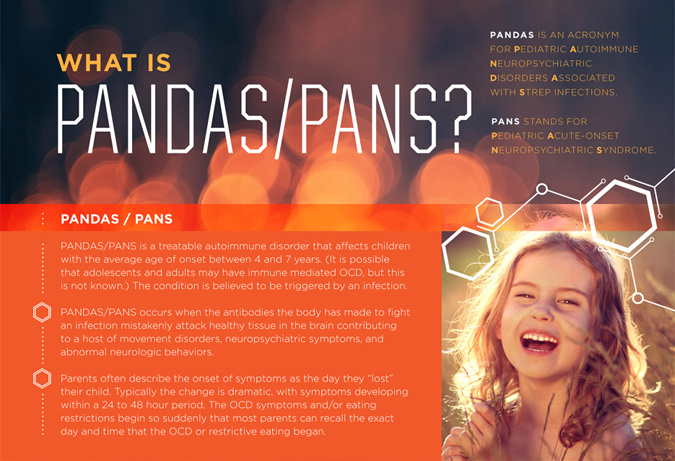 PANS/PANDAS is treatable neurologic condition caused by autoimmune dysfunction where a patient’s own antibodies begin to attack his or her brain. 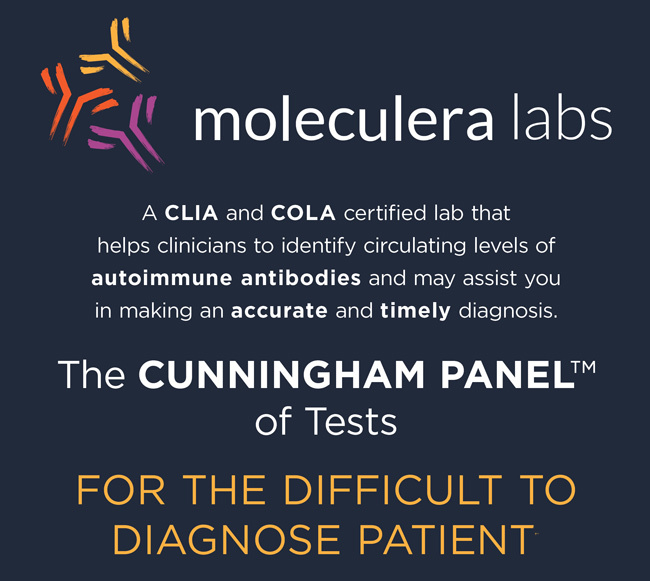 Moleculera provides personalized clinical testing services using the Cunningham Panel to help physicians diagnose children thought to be suffering from this condition. The Cunningham Panel is the result of more than a decade of research, funded in part by Oklahoma Center for the Advancement of Science and Technology, led by University of Oklahoma professor Dr. Madeleine Cunningham, Moleculera co-founder. Moleculera Labs, a CLIA (Clinical Laboratory Improvement Amendments) certified clinical laboratory offering testing services for childhood autoimmune conditions, has received COLA lab accreditation along with the Laboratory Excellence Award for their commitment to quality patient testing and laboratory practices. The company recently received clinical licenses from California, Maryland, Florida and Rhode Island and is now authorized to receive specimens from 49 states, with a license application pending in New York. Overall winner acceptance speech of Dr. Craig Shimasaki, President and CEO of Moleculera Labs for 2013 The Journal Record Innovator of the Year award. Pediatric autoimmune neuropsychiatric syndrome (PANS) and pediatric autoimmune neuropsychiatric disease associated with streptococci (PANDAS) are triggered by common infections in children that unfortunately result in molecular mimicry, which cross-react and attack normal healthy functions of the body. These two disorders are treatable conditions if addressed as an underlying autoimmune disorder rather than a neuropsychiatric disorder, said Dr. Craig Shimasaki, Moleculera co-founder and CEO.